Described as the book shop with the best view in the world, Kalk Bay Books is a gathering place for locals and visitors alike, who browse and buy books, share a glass of wine or two with visiting authors, and gather for new book launches or discussions. The leather sofa invites customers to spend some time considering the books on offer, and to catch up on international book news with the New York Review of Books and other reading matter provided for their interest. Today, instead of tall tales being told around the bar counter, tales are sold at a shop counter, which was specially designed with a nod to the history of the building. 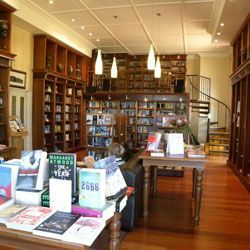 Kalk Bay Books occupies premises that have a varied and interesting history. 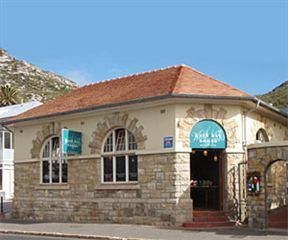 As recorded by author and historian Michael Walker in Kalk Bay: An Historical Booklet and Walk (Kalk Bay Historical Society), the building that now houses the bookshop was originally known as Die Klipkantienjie and was designed by architect John Parker in 1913. If getting to the book shop is a problem, you can browse their online books selection, which includes hand-selected fiction and non-fiction books, and many book lists offering their suggestions on a wide range of themes in the Open Books section of the website. Charming bookshop, worth popping into. Kalk Bay Books is 22.5km from the centre of Cape Town , the nearest airport 24.2km (Cape Town International Airport).